How does one choose a wine highlight of the week? I try to pick one wine I’ve had during the week and post about it. If you follow me on Facebook or Instagram, you know I do try a lot of wines during the week. 😉 and believe me, I usually love them all. But one stood out for me this past week. The HL Vineyards 2011 Cabernet Sauvignon. What a treat!! It was a great evening! A few friends hanging artwork and a few cooking to get ready to BBQ the steaks. What could be better? Well….add a great bottle of wine and there you have it – a perfect evening. Wonderful friends, great food, awesome wines! 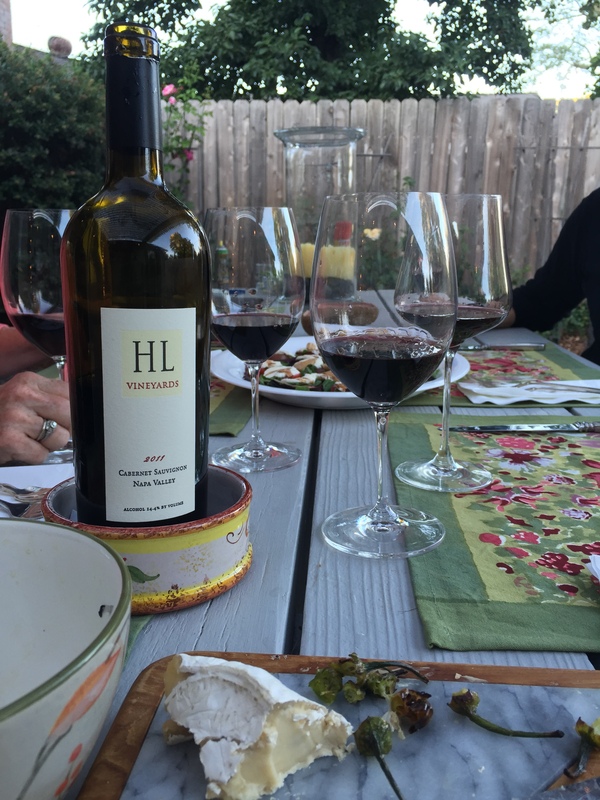 The HL Vineyards 2011 Cabernet – what a lovely wine! I know a lot of people think the 2011 vintage was not a good one. But I am here to tell you, I am finding some wonderful wines (especially Cabernet) coming from that vintage. This wine is a very elegant Cabernet. Low alcohol for a Cabernet. 14.4% ABV. Softer tannins than most. The nose gave some bright red fruit, layered with nice toasty oak and hint of vanilla. Upon sipping, it was beautiful red fruit with a lovely spice rack and mocha and coffee flavors. I loved this wine, and I thank my friend for sharing it and a lovely evening with us.